Francine's Friends: October Glo Features Francine's Friends! 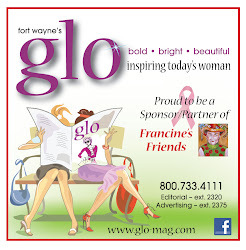 October Glo Features Francine's Friends! "Come one, come all. Be a friend. Bring a friend." That's what page 30 of the October issue of Glo magazine asks us all to do. 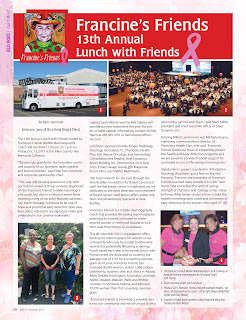 Glo magazine has been a long-time community partner and friend to Francine's Friends. 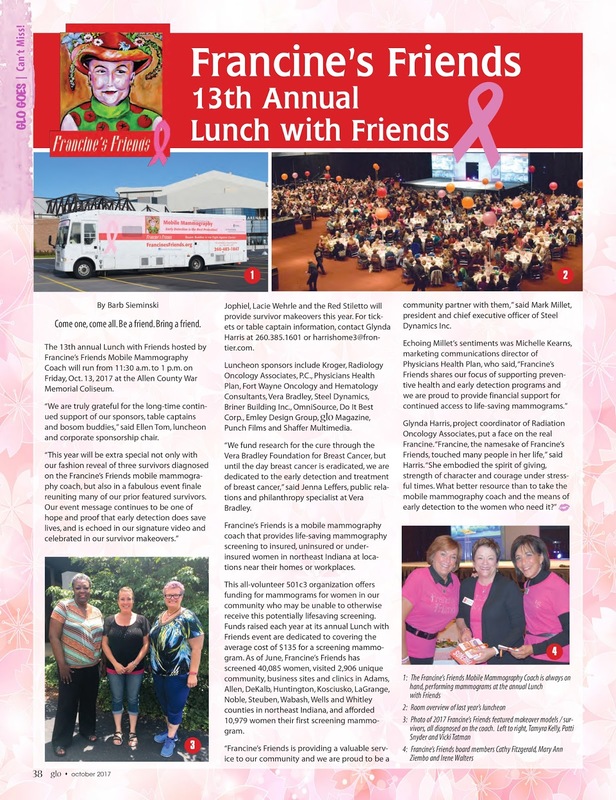 Each issue helps create awareness by including the schedule for the Francine's Friends mobile mammography coach, how to schedule a mammogram, and a factoid about the importance of early detection as the best protection in the fight against breast cancer. Echoing Millet’s sentiments is Michelle Kearns, marketing communications director of Physicians Health Plan, who said, “Francine’s Friends shares our focus of supporting preventive health and early detection programs and we are proud to provide financial support for continued access to life-saving mammograms." 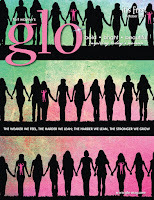 The September issue of Glo included a feature update of "Where Are They Now?" highlighting a few of the model/survivors from our annual "Lunch with Friends". It was good to offer Glo readers a chance to catch up with "Francine's Friends" Eva, Melissa, Angel, Donna K., and Ann. "We are appreciative for our continued partnership and value Francine's Friends and its mission tremendously," said Executive Director Sue Rawlinson. 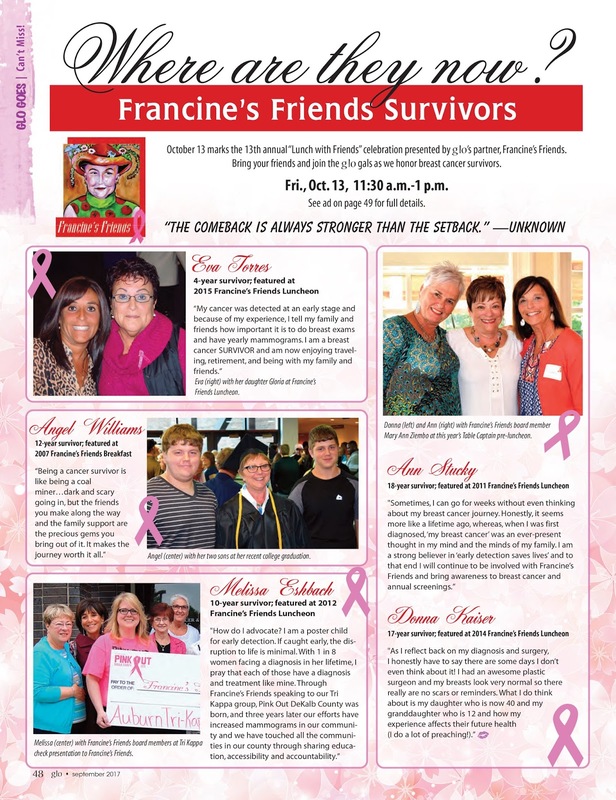 And Francine's Friends is equally appreciative — we couldn't do it without the help of Sue, Melissa, Lynn, Barb, Betty, and all of our friends affiliated with Glo magazine, Senior Life and The Papers. Thank you for your continued friendship and commitment! 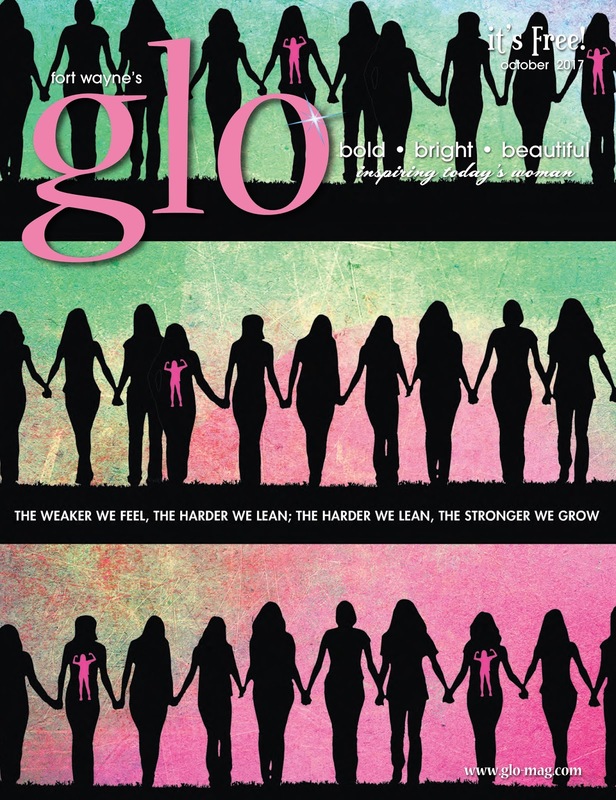 The October issue of Glo is on newsstands now!